From left to right: NASA's Steve Swanson, German astronaut Alexander Gerst and NASA's Reid Wiseman line up after Gerst shaved both NASA astronauts' heads to even a bet the NASA astronauts lost after the United States lost to Germany in a World Cup match on June 26, 2014. For two American astronauts aboard the International Space Station, losing a bet meant losing their hair. "Our condolences on your loss today for Steve and Reid," someone from NASA's Mission Control in Houston radioed up to the station before the shaving. "Flight wanted to point out that bald is more aerodynamic when flying." 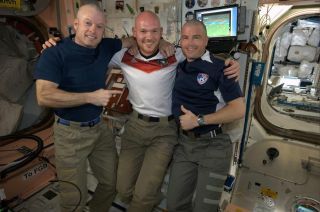 The three astronauts had a friendly wager going as the two teams faced off: If Germany lost, Swanson and Wiseman would get the chance to draw an American flag on Gerst's (already bald) head, but because the U.S. national soccer team fell to the European nation 1-0, Gerst got the chance to shave Wiseman and Swanson bald. German astronaut Alexander Gerst shaves NASA astronaut Steve Swanson's head after the United States fell to Germany in a World Cup game on June 26, 2014. The three space station crewmembers posted photos of the shaving on social media. One of the images even shows a World Cup match playing on the computer in the background. "It was nice to wake up this morning and not worry about my hair. There isn’t any," Wiseman wrote on Twitter Friday (June 27). Wiseman, Gerst and Swanson have been showing off their soccer spirit all week. On Wednesday (June 25), NASA released a video of the three astronauts playing a microgravity version of the sport in the modules of the space laboratory. The three crewmembers performed their versions of a goal celebration dance, and NASA's Robonaut 2 — the humanoid robot designed to eventually help the astronauts with space station work — also did a little jig for the camera. German astronaut Alexander Gerst shaves NASA astronaut Reid Wiseman's head on the International Space Station after the United States lost to Germany in the World Cup on June 26, 2014. Even though the U.S. lost the match against Germany, the Americans will continue on in the tournament — which happens every four years — because they ranked high enough in their group to advance. Wiseman, Swanson and Gerst are joined on the space station by three cosmonauts: Alexander Skvortsov, Oleg Artemyev and Maxim Suraev. The six crewmembers make up the station's Expedition 40 crew.